Valley Fever & Chamonix Ski Domains, Aiguille du Midi, Les Grand Montets.. The Chamonix Valley has a wide range of terrain that appeals to all levels - from beginners to adventure seekers, there is something to suit everyone. Incorporating Le Tour, Les Grand Montets, Brevent, Flegere and Les Houches, we have a staggering vertical drop of 2807m, 207km of pistes and an endless array of easily accessed off-piste. In addition, Courmayeur (Italy), St Gervais and Megeve (France) are all included in the MBU ski pass and offer superb day trips. 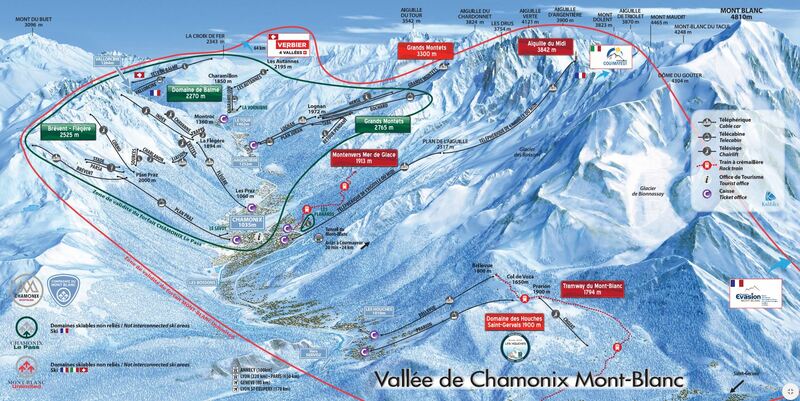 Only 30 minutes away in one of our minibuses, why not try these extensive ski areas as part of your Chamonix ski holiday? With 90% of our ski area above 2000m our snow record is the envy of the Alps. While thrill seekers and advanced skiers hunt out and find the steeps, deeps and drops that delight the best of free riders, beginners and intermediates take pleasure in the gentler runs available and our stunning alpine scenery. 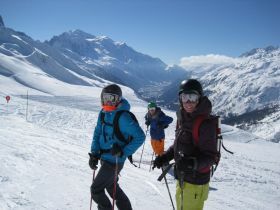 The Chamonix Valley offers terrain to suit everyone and some of the best views in the Alps. Le Tour, also known as the ‘Domaine de Balme’, is the area sitting at the top of our valley that we recommend for your first day on the mountain. The views are breathtaking overlooking the Mont Blanc Massif to the left, the Aiguille Rouge to the right, and there is terrain to suit all abilities. La Vormaine at the base of Le Tour has one of the best nursery slopes in the Alps and beginners can progress from there to the gentle blues overlooking the valley. For intermediates this is great confidence building terrain, and Le Tour is a great place for your first off-piste tracks with mellow terrain just next to the markers. Further afield advanced skiers and boarders can marvel in powder tracks through the forests to the side of the Tete de Balme chair. 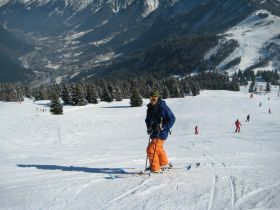 The Flegere ski domain is located above the hamlet of Lez Praz and our Chalets Flegere, Les Drus & Signal. It combines with the Brevent domain above Chamonix town. Together they form an interlinked ski area on the south facing sunny side of the valley with 57km of pistes and amazing close up views of Mont Blanc and the Glacier des Bossons. On cold December or January mornings the sun trapped pistes here offer warmth to your bones, terrain to suit all, and a picture postcard backdrop. Both Flegere and Brevent have gentler pistes for beginners and intermediates lower down, with more challenging reds and off piste higher up. We like to traverse both areas in the same day, via the easier blues or more challenging routes depending on our group, and then we feel we have earned that après ski drink. 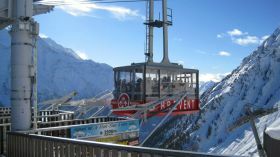 The ‘Brevent’ telepherique at 2525 metres, has stunning views from the top and a restaurant well worth visiting. Access from the restaurant is by return telepherique or the easiest black run in resort which holds the snow well and is often the best run of the day. World famed as the off-piste Mecca ‘Les Grand Montets’ and its North facing slopes above Argentiere offer the advanced intermediate and expert an unforgettable experience and a vertical drop of over 2km! This is not only an area for experts, and for winter 2018/2019 the lower terrain around the mid station has seen extensive remodelling and a new chairlift, expanding the easier runs available for beginners and lower intermediates, making Les Grand Montets a good option for all. The North facing high altitude slopes here hold snow well beyond the ski season ends, and the local weather systems deliver an abundance of powder each year. Add that to two boarder and ski cross tracks, a superb home run (Pierre a Ric) and stunning glacial view and it’s easy to understand how this area is a favourite of many. Les Houches is located at the bottom end of our valley and is a superb ski domain with some great Mont Blanc and Chamonix views. The runs here are tree lined and family orientated, ranging from gentle blues to the famous Kandahar World Cup Downhill piste. After a hard ski day, and a superb lunch in one of the traditional restaurants here why not try the ‘Kitsch Inn’ for some live music and an après beer or lemonade before we collect you? During your stay with Valley Fever we’ll offer you the option of a day trip to Courmayeur (Italy) with a small additional charge. 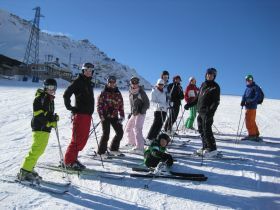 This is a really popular option with our guests and is 30 minutes away through the Mont Blanc. With 100km of pistes and some easy to reach tree-lined skiing, a day here is complimented by delicious Italian cuisine and those hot chocolates that you can stand your spoon in upright without it touching the sides of the mug. We usually go here on a Tuesday or a Thursday depending on weather and road conditions. Please ask us for more details. Now included in the Mont Blanc Unlimited ski pass, you can ski as many days as you like in the Evasion Mont Blanc ski area, including St Gervais, Megeve and many others. Only a short drive away, we can deliver you there in 30 minutes for a small extra fee and collect you at the end of the day. The area is a fantastic day trip with gentle tree lined terrain, stunning Mont Blanc views and something to offer all abilities, including the superb Folie Douce on piste après ski bar. With live music and dancing on the tables, try not to miss the bus back! The Aiguille du Midi is the gateway to the world famous off piste route – the Vallee Blanche. This vertical decent of over 2800m covers 18km of glacial skiing over stunning terrain, passing huge seracs, crevasses, and rugged mountain scenery. Access to this is via a narrow snow ridge while wearing crampons, making you feel like a true mountaineer. Whether you ski the Vallee Blanche or not, the telepherique ride itself is an experience not to be missed and the views from the summit are inspiring and a must for any budding photographer. Take the cable car from its base in Chamonix-Sud and the ground disappears quickly. The 2nd cable car to the summit makes you feel within reach of Mont Blanc. The Vallee Blanche can be tackled by anyone who is a good intermediate or above depending on conditions, although you must take a guide as there are hidden dangers to be avoided. With good snow cover you can ski or board all the way back to Chamonix Centre at 1035m, giving a vertical decent of 2.8km. For skiers, boarders or non-skiers alike we highly recommend this trip, although please note this is part of the ‘Mont Blanc Unlimited’ ski pass only.